Wheat pockets following baati recipe. 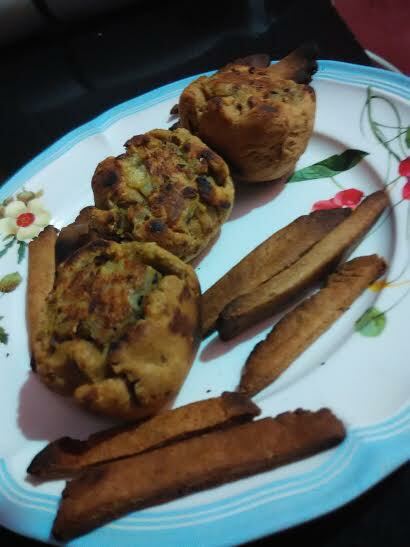 You may call it stuffed baati, but it's open like a basket. Just stuffed the wheat basket with potato filling. Worth a try for occasional oil-free treats! Made on gas stove. Mix everything and make a dough. Keep aside for 20-30 minutes. Sambar powder- 1 tsp (optional) (I used home made) Here's the sambar powder recipe. Take a pan, heat oil. Add coriander powder. Mix and add ginger-chilly paste. Mix everything well. Add sambar powder. Switch off the flame. Roll out small balls from the dough. Take one ball, roll it out like a small chapati. Add the filling. Close the sides like a basket. Follow the same process for all baatis. Brush baatis with little oil. I used little dough to make baked wheat chips along with baatis as shown in picture. Take a skillet (tawa). Keep a greased pressure cooker over it. Place baatis on the surface of the cooker. I also placed the wheat cubes along with baatis. Cover the cooker lid and remove the whistle. We need to bake on a medium flame. Keep an eye on the baatis after 5-10 mins. You may have to switch sides intermittently for even baking. It may take 18-20 mins or more. Keep an eye on the sticks, which may bake quicker than baatis.